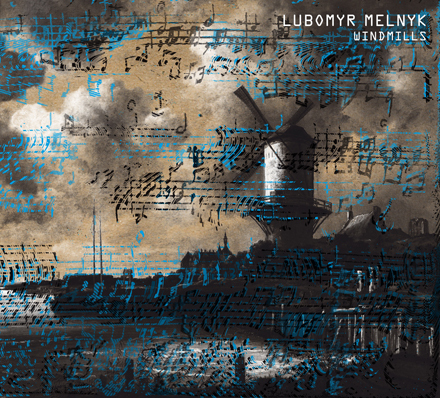 Windmills (2014), the latest release from renowned Ukrainian virtuoso pianist and composer, Lubomyr Melnyk, draws its inspiration from the original Walt Disney animation, The Old Windmill. Employing the windmill as a solitary symbol of strength and endurance in the face of Nature’s worst, Melnyk aligns said qualities with man’s endurance of life’s hardships in three tributary movements, each building one upon the other, the music all the while creating the wind-swept effect of ascension as the listener is swept off and up into a vortex of sprightly and spiraling notes. The sound itself voices the story of the windmill’s mettle-testing hardship, as it stands alone on a darkling hill enduring Nature’s violent unrest, the stormy effect actuated by the piano’s buffeting notes. How does Melnyk achieve this effect? In all probability, the word how is likely just as much associated with Melnyk as piano is. Here’s why: Melnyk’s technical ability, truly, is currently without match in the realm of music performance. His talent affords him the ability to play nineteen notes per second, simultaneously, in each hand. That alone demands attention. However, for Melnyk, personal ability is not solely what drives him to document his extraordinary talent. Melnyk’s concern appears to be rather in what his ability can confer upon others. His aesthetic leads him to blend several notes into triumphs of beauteous harmony and caliginous discord not only for the act in itself, but for a simple love of music and the power conferred by it to displace, and potentially transform, the individual through its unbridled energy. “The sound is another dimension,” says Melnyk, hands on fire, mind on the move, commenting on the moving power of music’s force. But it’s Melnyk’s power of organization that gives noble form to the burnished compositions heard on Windmills. Make no mistake, the swirling architecture of sound heard in these daedal pieces didn’t come about arbitrarily. This album alone was three years in the making; and this style of piano playing, coined by the artist himself as, “continuous music,” was and continues to be developed by Melnyk after decades of fruitful experimentation. What is continuous music? Music, by design, that ensconces its listener in a transcendental state through the sheer force of sound orchestrated by a masterful focus: total sound immersion. The relentless, ever-coming notes intricately weaving a macrocosmic tapestry, continuously shape the sound, ever in flux. The effect is sustained by the wealth of incoming notes ascending to transformative release, which, in Windmills, serves to parallel the virtues of strength and resilience by once again aligning the sound with the windmill’s image, both before and after its death. Under Melynk’s direction, the nomadic thirst to roam is quenched by his piano aflame, a portal of boundless transportation to another dimension licked by the fires of sound.